ibson celebrated its 100th anniversary in 1994, marking a century of significant achievement where Gibson introduced more guitar innovations than any other company. The company's craftsmen and engineers developed the truss rod, stop tailpiece, Tune-O-Matic bridge, humbucking pickup, and archtop and semi-hollow-body guitars. Several Gibson guitar designs have proven to be timeless, including the Les Paul, ES-335, J-200, and Super 400. It is unknown exactly when Orville Gibson, the company's namesake, made his first instrument. Sometime in the 1870s he acquired a small workshop in Kalamazoo, Michigan, and began building mandolins based on violin construction techniques. Gibson strongly believed that unstressed wood provided superior vibrating characteristics, so he introduced the idea of carving the instrument's back, top, and sides instead of bending and forming them to shape. He used this construction technique to build the first archtop acoustics. In 1898, Gibson was granted his first and only patent for a mandolin design. By the turn of the century, Orville Gibson's reputation as a builder of fine stringed musical instruments had expanded to the point that he could no longer single-handedly produce enough instruments to keep up with demand. On October 10, 1902, he signed a contract with five Kalamazoo financiers, forming the Gibson Mandolin-Guitar Manufacturing Company. For unexplained reasons, Orville was not a principal stockholder, although he did own few shares of stock that he sold in July 1903. Instead, he entered into a separate contract where he was granted a lump sum of $2,500 and monthly payments. He remained at Gibson for two more years, working as a consultant and training workers about his construction techniques. The 1902 Gibson catalog, the company's first, listed six different models of Style 0 and Style L guitars: the 0-1, 0-2, 0-3, L-1, L-2, and L-3. All were large archtops with either oval soundholes (style 0) or round soundholes (style L). The company also offered four different harp guitars. In 1906 the operation expanded, and the company started leasing two buildings. Production manager Sylvo Reams perfected many of Orville's techniques, improving the instruments' playing action and producing products with higher quality materials and better finishes. In 1908 Gibson introduced one of the first production guitars featuring a cutaway, a model now known as the Style O Artist. Within two years the company had been granted patents for the intonation-adjustable bridge, the elevated pickguard, and the harp guitar. Until the early '20s, the mandolin was the most popular stringed instrument in America, and mandolins accounted for the bulk of Gibson's sales. Gibson produced mandolins in several sizes, ranging from standard-size models with 13-7/8" scales to huge 42"-scale mandobasses. By 1921 the banjo was all the rage, and mandolin orchestras turned into banjo combos almost overnight. Gibson had started producing banjos in 1917, so they were ready for this shift in public taste. However, the demand for guitars was not as marked, and Gibson guitars underwent few design changes during this period. Lloyd Loar, who joined Gibson in 1919, supervised the development of Gibson's first modern guitar, the L-5, introduced in 1922. A talented acoustics engineer, mandolinist, composer, and educator, Loar assumed many responsibilities during his five-year stay at Gibson, including those of chief engineer, head of quality control and research and development, and patent applicant. Although Loar was not the sole designer of the Master line Master Tone instruments, which included the L-5 guitar, F-5 mandolin, and TB-5 banjo, he was directly responsible for the f-hole design, narrow pegheads, and two-footed, intonation-adjustable bridge. As the guitar's popularity increased during the '20s, Gibson started producing several new models, beginning serious production of flat-top guitars in 1926. (Their first flat-top model, the GY or "Army-Navy," was a low-budget affair produced from 1918 to 1921. Gibson ads dismissed the guitar, saying it was "not a Gibson.") Gibson transformed the L-1 model from an archtop to a flat-top and introduced several other flat-tops, notably the professional-quality Nick Lucas model. The company started producing the low-budget Kalamazoo line in 1929, just in time for the Great Depression. During the '30s demand for guitars increased markedly. Gibson expanded its line accordingly and started listing guitars first in their catalogs, which now offered a full line of archtop f-hole guitars and flat-tops. In 1934 Gibson introduced their top-of-the-line archtop, the Super 400, and their first jumbo flat-top model, the 16"-wide Jumbo. After witnessing Rickenbacker and Dobro's success with electric instruments, Gibson started producing their first electric steel guitars and amplifiers in 1935. One year later they were the first major company to make a hollowbody, Spanish-style electric guitar, the ES-150, which was popularized by Charlie Christian. Gibson's other outstanding acoustic models from the '30s included a larger and fancier version of the L-5 and Super 400, introduced in 1939. These guitars were their first production models with a modern-style, rounded cut-away. This same year Gibson produced the Electraharp, the first modern, professional-quality pedal steel. Gibson's production dropped drastically in 1942 because of World War II. Quality materials were restricted or difficult to obtain, and the company began manufacturing parts for items used in the war effort. Gibson was unable to produce instruments that lived up to their standards of quality, so several models such as the L-5 and Super 400 were temporarily discontinued. The company introduced one flat-top model, the J-45, during the war. In 1944 the Chicago Musical Instrument (CMI) company obtained controlling interest of Gibson. CMI anticipated an immense increase in guitar sales following the war, so Gibson prepared to reintroduce its most successful models and launch a new line of electric guitars, the first being the ES-350, which debuted in '47. The beginning of an era that many consider Gibson's golden age was marked by the arrival of Ted McCarty in 1948. McCarty was Gibson's president from '50 until '66, a period of substantial growth. "Before I joined Gibson," McCarty recalls, "they had done a little less than a million dollars in sales that year. There were about 150 employees total. The factory, a three-story building between 40 and 60,000 square feet, was built in 1918. When I left on June 30, 1966, we had 250,000 square feet of factory, 1,200 employees, and 15 million dollars in sales that year." One of McCarty's earliest contributions was the fingerrest pickup unit, a floating pickguard/pickup assembly that allowed Gibson to quickly and inexpensively expand its electric guitar line. McCarty also helped develop the ES-5 and ES-175, both introduced in 1949. The latter became Gibson's longest-lived electric archtop and is still in production. As president, McCarty initiated the development of Gibson's first solidbody electric guitar, the Les Paul model, which debuted in 1952. Numerous timeless innovations were introduced during mcCarty's reign, incluing the humbucking pickup and the Tun-O-Matic bridge. With the help of a highly talented staff, he designed the first thinline archtop (the Byrdland), the first semi-hollow electric (the ES-335), and ahead-of-their-time solid bodies such as the Flying V, Explorer, and Moderne. In 1957, he convinced CMI to purchase Epiphone, greatly increasing the company's market share. After McCarty's departure, Gibson introduced few models of note during the late '60s, the only exception being the fancy Citation model. Demand for the late-'50s, single-cutaway Les Paul Standards increased markedly due to Eric Clapton's and Michael Bloomfield's use of them, but Gibson responded to the demand by reissuing the Les Paul Custom and a gold-top model with two P-90 pickups, which were not exactly what players wanted. Nonetheless, these models sold quite well. In 1969 Gibson became the property of Norlin, a company formed by the merger of CMI and ECI, an Ecuadorian brewery. It was the beginning of a dark era that many collectors feel had negative repercussions equivalent to those associated with the CBS takeover of Fender. A few products of note came out during the '70s, including the L-5S and the Kalamazoo Award. However, most of the models were dismal commercial failures, such as the ill-fated Mark-series acoustics and the Marauder, S-1, and RD electrics. Nonetheless, demand for Gibson guitars was brisk, and the company opened an additional production plant in Nashville in 1974. Gibson's follies continued into the early '80s. Sales declined, and the company was forced to close its Kalamazoo factory in '84. Several poorly received new models were introduced and discontinued in a flash, including the Victory, Sonex, Futura, Corvus, Challenger, Invader, and Spirit solidbodies. There were a few bright spots, namely the Chet Atkins Standard classical electric and the Chet Atkins SST steel-string electric/acoustic, both still in production. Norlin eventually woke up, smelled the polyurethane, and decided to bail out of the guitar business. In January 1986 Henry Juskiewicz (Gibson's current president), David Berryman, and Gary Zebrowski purchased the entire Gibson operation. Juskiewicz was a huge fan of Gibson guitars, and he vowed to revive the company's reputation as a builder of quality instruments. Shortly after the transfer of ownership, Gibson began to acquire several other companies. They bought the Flatiron company in Bozeman, Montana, using the factory to build a new breed of acclaimed acoustic guitars, including high-quality reissues of the Advanced Jumbo and J-200. Other Gibson acquisitions include Steinberger, Oberheim, and Dobro. In the '90s Gibson introduced its Historical line of reissues that are constructed as closely as possible to the original specifications. The Nighthawk solidbodies were one of Gibson's most successful new models in many years. In celebration of Gibson's 100th anniversary, the company made a special commemorative line of guitars. A different electric and acoustic model was released each month during 1994, each in a limited-edition run of 100. The electrics featured fancy appointments such as inlaid diamonds, a 22K gold-plated coin on the back of the headstock, and a diamond-jeweled sterling silver serial number. 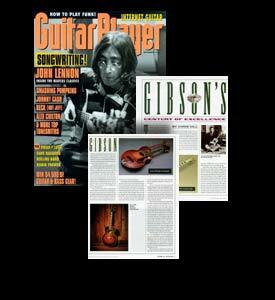 Because the company was formed in 1902, many guitar historians wonder why Gibson celebrated its centennial in 1994. According to Gibson, the 1894 origination date is based on a 10-string mandolin-guitar that features a small, celluloid medallion reading, "Made by O.H. Gibson, 1894." This is Orville's earliest instrument with a confirmable date, though by no means was it his first instrument. In ads, catalogs, and brochures dating back a half a century, Gibson has touted 1894 as the company's origination date. Though some may dispute the date, no one can deny that Gibson's contributions are worthy of celebration.